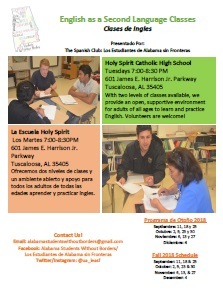 About the Spanish Club: Los Estudiantes de Alabama sin Fronteras is a Spanish language based service organization whose mission is to promote student involvement within the Tuscaloosa Latinx community in order to break down cultural and language barriers. We do this through a number of free English as a Second Language classes that we teach in the community. 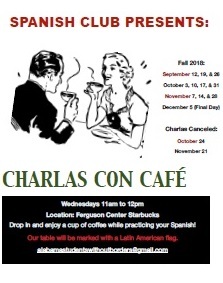 Additionally, we host a weekly “Charlas con Café” or Coffee Conversation Hour that allows students to practice their Spanish and learn about different cultures. Finally, we host a monthly culture night where students on campus are invited to learn more about different aspects of Latinx culture. 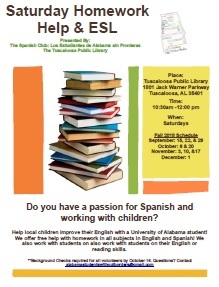 Students of all Spanish speaking abilities are welcome to participate. Watch our video to find more about who we are and what we do! 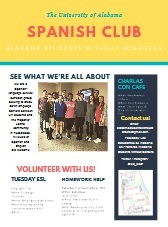 The Spanish Club hosts a variety of events every fall and spring semester. 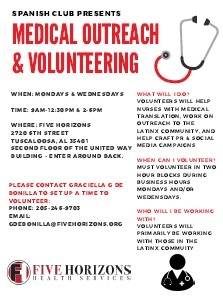 See the images and links below for recent semester’s activities, including a weekly conversation hour, tutoring Spanish speakers in English on Tuesdays and Saturdays, and medical outreach. Below are also listed some examples from past years.